Yesterday, God started stirring up in me the truth that none of us (who ever have been, are, or will be) will ever be forgotten by Him. Then I saw the photo of the three year old Turkish boy who washed up on shore, and my heart leap into my throat, almost cutting off my breathing for the weeping within. Each refugee crying out for justice. Each battered woman in hiding. Each homeless person shivering looking for warmth. Each child dying of starvation, or from abortion. Each widow weeping over what she has lost. Each person who feels abandoned. If you can feel it or experience it, it matters to Him. Because you matter to Him. He wrote your name on His heart when He shaped you. He will never forget you, no matter what you are going through. You are known & treasured by the God who loves you so much He died to reveal it to the rest of the world. God is moved by the state of the world, all of it. He always been has & He always will be. God is moved by the state of our hearts, the events which shape our lives. He always has been, and always will be. 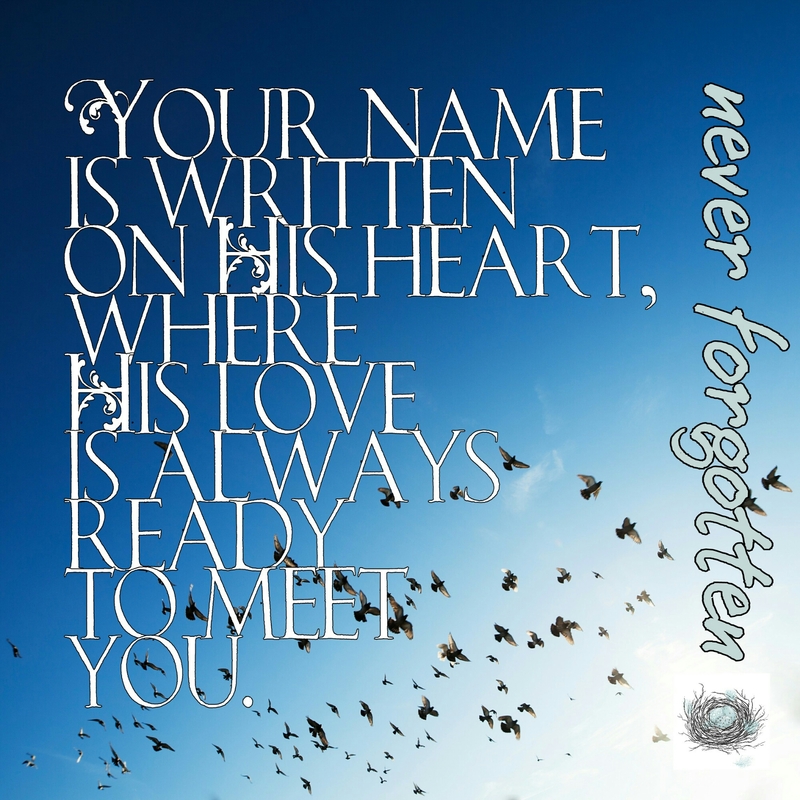 Your name is written on His heart, where His love is always ready to meet you. Don’t forget, you are never forgotten. Remind yourself through His Word. Speak it out loud in thanksgiving & faith. Trust His love is for you. Walk in hope.